I needed a beach bag. Fine, I saw this beautiful fabric and made up a project to go with it. I normally don't like theme fabric to go with a theme, but this fabric was too cute to pass up. My own pattern A peek at one of the outside pockets. It's beautiful! And what are you talking about? 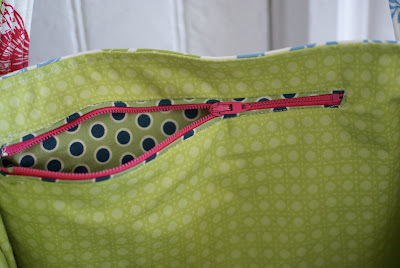 Of course you needed a beach bag. Doesn't everyone? 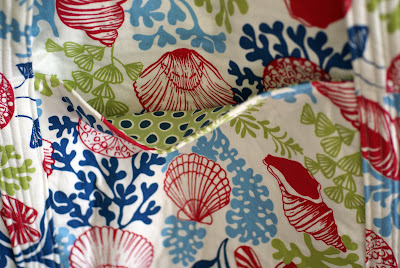 That fabric says beach like no other fabric could! It's really pretty. 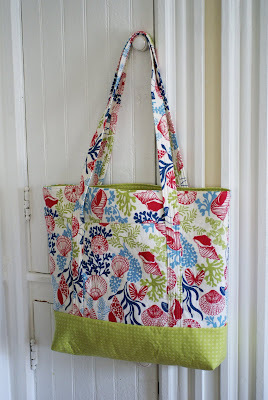 I love this fabric, the bag came out so nicely but it's too nice to take to the beach and get sand all over! I love the bag and the fabric it's gorgeous. Congratulations for this lovely project.